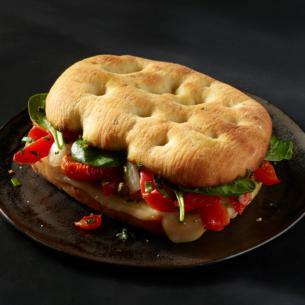 Mozzarella cheese is melted over freshly roasted red peppers with onions, capers and tender baby spinach. A lively kale-basil pistou is spread across a black pepper and potato schiacciata roll. This roll has a soft texture and a taste that enhances each flavor chosen for this sandwich. potato pepper schiacciatta bread (enriched wheat flour [flour, niacin, reduced iron, thiamine mononitrate, riboflavin, folic acid], water, sunflower oil, dehydrated potatoes, baked potato [potatoes, extra virgin olive oil, salt], eggs, extra virgin olive oil, cane sugar, salt, chive, yeast, black pepper, cultured wheat starch, malted barley flour, enzymes), smoked mozzarella cheese (pasteurized milk, cheese cultures, salt, enzymes, natural smoke flavoring), pepperonata (red peppers [red peppers, water, organic vinegar], tomatoes, onions, capers [capers, water, vinegar, salt], expeller-pressed canola oil, salt, basil, garlic, extra virgin olive oil, spices, organic vinegar, citric acid), kale-basil walnut pistou (kale, canola oil, walnut, basil, parsley, garlic, extra virgin olive oil, salt, lemon juice), lemon extra virgin olive oil (extra virgin olive oil and pure lemon oil), spinach. may contain: soy.